The 01 March 2017 build (11021) is out. The 01 March 2017 build is out. Re: The 01 March 2017 build (11021) is out. I installed it on the last nightly build (Win7 64-bit) and since then when I click to view a function or define, it's opening the wrong one; same name but from another similar project and the project is not even opened in C::B.
I remember there is some kind of parser/symbol file to delete for forcing C::B to re-parse symbols but can't find it in older posts. Does using "Project>Reparse current project" help the issue for you? I occasionally have to do this or just re-open C::B because the parser had broken itself. After a very tiring reinstall - spell check not working. Last suitable for working version - 9958. You strongly over estimate how big a problem that spell check issue is for the user base as a whole. This build may be unstable. 2) NassiShneiderman plugin will be included in future build. Hi, biplab, thanks for the builds. start cblauncher.exe --debug-log --no-dde --no-check-associations --multiple-instance --no-splash-screen --verboseThen I have such error report, see image shot below. Confirmed that error message. Most likely it is an issue in CbLauncher. Need to investigate further. It is a new warning in wx3 that asserts if the zip file doesn't contain any xrc files in it. For some of the plugins this is really the case. I'm now convinced this issue is due to multiple instances; and not due to CbLauncher. C::B is unable to find zip files and load them. Manager failed to load XRC resource 'C:\CB_20170301_rev11021_win64\share\codeblocks\Cccc.zip'. In relation to software whitelist submission 4070276. In order to mitigate this risk, we recommend submitting new versions of your software to us. Symantec's decision is not a certification or endorsement of your software in any way, and you are expressly advised by this message that Symantec does not consent to you disclosing that Symantec has added your software to its White-List, or that Symantec has evaluated, endorsed or certified your software in any manner, directly or indirectly. Swapping out the astyle.dll for an older version solves it. Kilmatead: Can you post the full stacktrace or a minimal sample and steps to reproduce? Reproducing is easy (at least for me, Win7 x64)... thinking it might be some conflict of settings, I removed the %appdata% codeblocks user-settings and tried it stock and the same thing happens every time. Then hit Plugins -> Source Code Formatter, and I immediately get the same broken assertion every time. If I remove the ternary, then astyle formats just fine. Changing settings in astyle makes no difference, it seems to happen for all styles/options (in this latest version - like I said, DLL's for astyle from previous nightlies work fine). I first discovered this on a larger project, and narrowed it down to always (and only) happening on lines containing a ? : ternary. As an extra added bonus, when used with stock settings CB itself crashes, no matter which option is chosen. Under my usual setup I could at least 'Ignore' it and continue. To expand on Kilmatead issue. I reproduced it on Windows 10 32 bit. I can easily reproduce it here on Linux also. It crashes in the version from my copr-repo (latest trunk) and on F26 with C::B 16.01 linked again system-astyle. It's already fixed in astyle trunk. My wish is that the toolbars either are more compacted or somehow configurable so I can remove icons i don't use. They take up far too much space both horizontally and vertically. I have to disable the Code completion toolbar even though I have a 24' screen. My wish is that the toolbars either are more compacted or somehow configurable so I can remove icons i don't use. The current implementation of all the toolbar's are "hard-coded", I mean many of toolbar are written in XRC resource files, so it is not configurable. Maybe there are some functions in wxWidgest which can hide some ununsed icons. So, patches are welcome. and halved the widths of the 2 wxChoice items to 143 and 330 each, and then rebuilt Code::Blocks. That gave me a code completion toolbar half the width it was before. I still see most of what I need to see. I realize this is not a general or even portable solution, but at least it shows where the issue is. I didn't try to make the other toolbars more compact, they still waste space in particular vertically. The main problem seems to be caused by wxChoice items in combination with much "air" around. You are right. There is a sanity check in wx code that prompts that dialog if xrc file is missing. However there is no way to stop this assert message. For the time being we have to ignore this harmless message till a solution is found. We can just remove the calls for loading the resources, I think or even remove the empty zip files (I think there are some plugins without resources). We get this message only, if C::B is started with the "-v"-switch to show more verbose debugging messages, so it should not be a problem for the default user. Manager failed to load XRC resource '/usr/share/codeblocks/ThreadSearch.zip'. Manager failed to load XRC resource '/usr/share/codeblocks/headerfixup.zip'. Manager failed to load XRC resource '/usr/share/codeblocks/wxSmithAui.zip'. Manager failed to load XRC resource '/usr/share/codeblocks/CppCheck.zip'. Manager failed to load XRC resource '/usr/share/codeblocks/EditorConfig.zip'. Manager failed to load XRC resource '/usr/share/codeblocks/Cscope.zip'. Manager failed to load XRC resource '/usr/share/codeblocks/Valgrind.zip'. Manager failed to load XRC resource '/usr/share/codeblocks/DoxyBlocks.zip'. Manager failed to load XRC resource '/usr/share/codeblocks/Cccc.zip'. 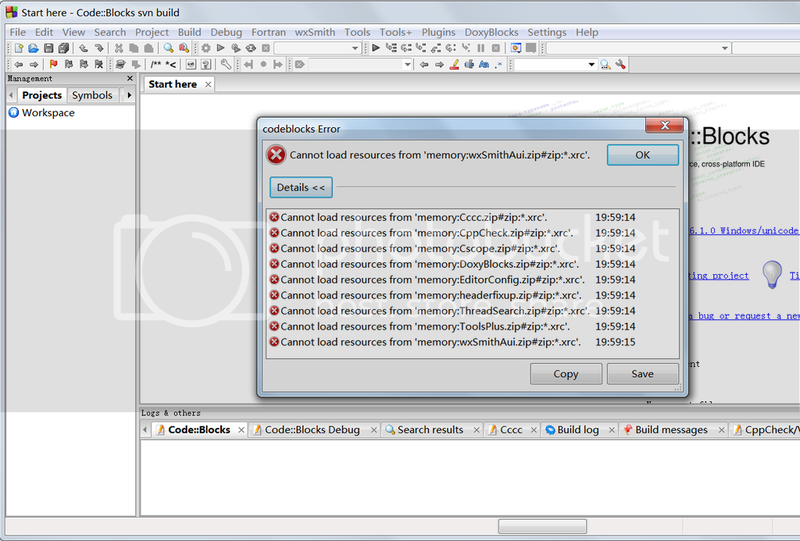 Manager failed to load XRC resource '/usr/share/codeblocks/ToolsPlus.zip'. The 'failed to load messages' are all in red. From the above discussion it looks like it can be ignored? Yes, these are the messages. Just ignore them. Since two last nightly build autoversioning plugin looks like broken. After restarting codeblocks it is reset all version data to zero. In this nightly the source formatter seems broken. It always raises a assertion failure. Jaap, this problem is corrected in SVN (r11039). You can compile from sources or wait for the next nightly.